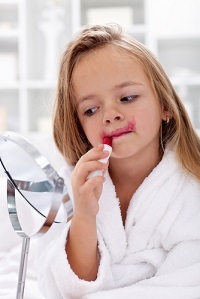 This blog post, When Should You Let Your Daughter Wear Makeup, comes from Live-Out Nanny. This Friday Remix post fits with my own makeup experience (posted today), so I thought our readers would enjoy this perspective, as well. Readers: Do you wear makeup? At what age did you start wearing makeup? What have your experiences been like? Share with us in the comments.